The high absorption of CBD increases when you are in the tub. The Full Spectrum CBD Oil inside these bath bombs can directly provide body relief and pure relaxation. Experiencing back pain, body aches, or you are looking to feel relaxed? CBD Bath Bombs mixed with essential oils are a great way to let CBD absorb into your skin. Made with organic hemp flower extract. The extract has the full power of the plant. Using an isolate will not provide all of the benefits of the entire plant. Hemp flower extract has been found to have a broad impact on cellular function, including mood stabilization, reduction of tremors or twitches and chronic pain, treatment of irritated skin, and acts as an anti-inflammatory, as well as as an antiseptic. 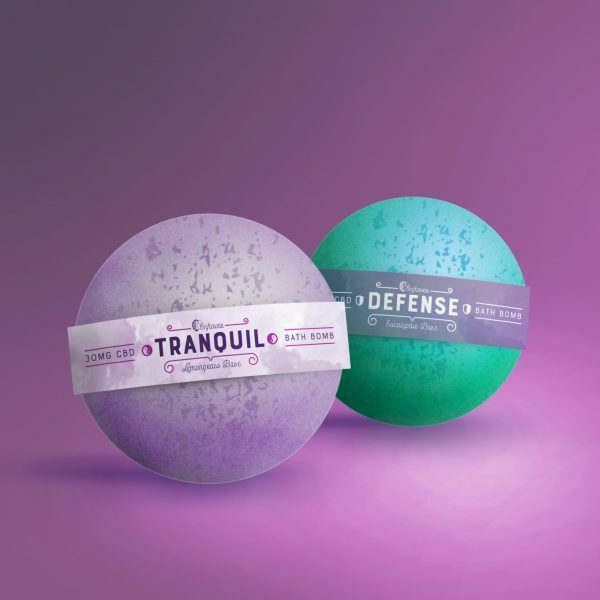 (Green) Defense CBD Bath Bomb – Originally dubbed the 5 Thieves blend, this combination of essential oils and hemp flower extract was created from an old recipe to promote health and vitality. (Yellow) Tranquil CBD Bath Bomb – Made with lemongrass, eucalyptus, rosemary, peppermint and bergamot essential oils and infused with Hemp Flower Extract. Pop this into your bath and enjoy. (Pink) Sensual CBD Bath Bomb – A sensual experience. This bath bomb contains essential oils that promote arousal and smell great together. Use alone or enjoy with your partner in the tub! (Purple) Utopia CBD Bath Bomb – Time for bed, but finding it difficult to relax? Let that stress go! Fill your tub with soothing hot water, drop this Utopia bath bomb in and get ready for a blissful night’s sleep. Ahhh! (Blue) Recovery CBD Bath Bomb – A therapeutic combination of Frankincense, Tea Tree, and Lemon essential oils with Full Spectrum Hemp Flower Extract designed to promote recovery from everyday life. The essential oil blend helps heal the skin and soothe the soul. True blue.